Hard to say why I didn’t like the The Killing Fields despite the fact that War and Journalism is a topic that I find fascinating and that this movie is considered to be one of the best of the genre. One of the problems I had was the length. The other one was the score. That’s such a dated score, it ruined the movie to a large extent. 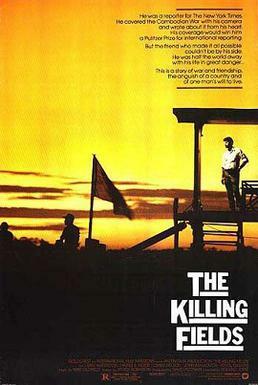 The Killing Fields is based on a true story and one of the first movies whose topic was the genocide of Cambodian people by Pol Pot. The two journalists Sydney Schanberg and Dith Pran have been covering the war in Cambodia since the early 70s. They are not only dedicated journalists but close friends. Pran serves as interpreter on their missions. In 1975 when the United States withdraw from the country and the Khmer Rouge, led by Pol Pot, advance on Phnom Penh, Pran, as a US sympathizer is in great danger. There was a moment when he and Syd could have left the country easily but things have developed too fast and now it’s hardly possible for anyone but US and European citizens to leave the country. Knowing what would happen to Pran if he stayed, Syd and some fellow journalist try to forge a US passport for him. Unfortunately the attempt fails and while his children and his wife have been able to fly out, Pran is left behind when the other journalists leave. Captured by the Khmer Rouge he is brought to a labour camp. In the second half the movie moves back and forth between a guilt-ridden Syd in the US, and Pran’s ordeal in the Cambodian labour camp. In imaginary letters that he writes to Syd in his head, he tells him what happens, interprets what we see. I’m not sure if this was a problem of my DVD but none of the parts spoken in Khmer have been subtitled. The parts in the labour camp are very well done. This isn’t only a labour camp. The labourers and especially the children are re-educated and brainwashed. They have to unlearn everything that they knew before. It’s of great danger to have “forbidden” knowledge, like foreign languages or any higher education. The children are easily turned into little fanatics and the grownups who are afraid of being executed try their best to obey. The Pol Pot regime was a systematic genocide and far over 2 million people were killed. Even though I didn’t particularly like it, I must admit the movie has its merits. And the Cambodian actor, Haing S. Ngor gave a very touching and convincing performance. Danis Tanovic’s No Man’s Land is without any doubt one of the best war movies I have ever seen. The actors are outstanding, the story is different and manages perfectly to convey the tragic absurdity of war. It also very funny, unless you have never heard of black humor or satire. 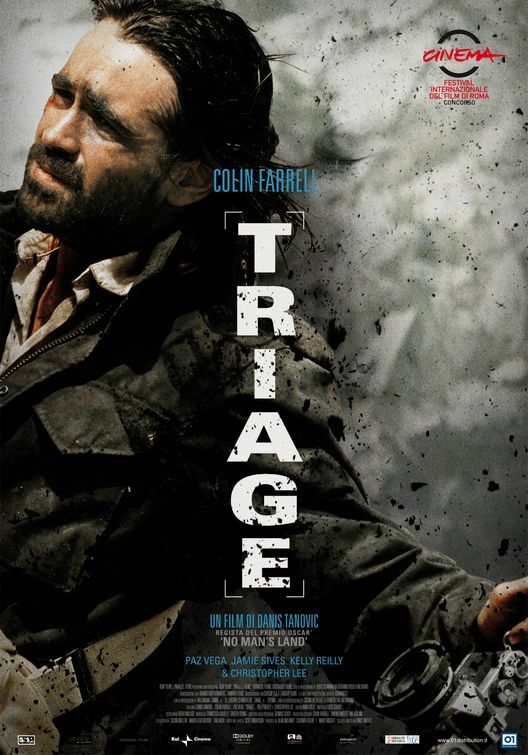 The movie starts with a group of Bosnian soldiers on their way to the front, bickering and teasing each other and lost in the darkness and the fog. They try to find the way for a while but it’s useless. After some more bickering and sharing of cigarettes, they stop and go to sleep. Horror on horror, when they wake up they realize they are in between the front lines and very close to the Serbs. The fun is definitely over now and as soon as they start to run, the Serbs open fire. Ciki is catapulted by an explosion into an empty foxhole, in the middle of No Man’s Land. He hides in the foxhole until two Serbian soldiers arrive to investigate if there are any enemies around. They find Cera, who has also been catapulted into the foxhole and, thinking he is dead, they booby-trap his body. After a while they finally discover Ciki who shoots one of the two Serbs. Two enemies are now trapped in between their lines, together with a unconscious man, attached to a mine, whose every move could make the thing explode. What follows is one of the most comic farces I have ever seen. Trapped in between enemy lines, they start to quarrel and fight, all the while the poor Cera moans because he needs to go to the toilet, is uncomfortable and thirsty, wants a fag… Ciki keeps on asking him if he is OK which is, considering the circumstance, in a grotesque way funny as well. A lot of the humor stems from the dialogue. Although they find themselves in the most dire circumstances they still argue and quarrel like a family at the Sunday dinner table; petty grievances, teasing, sulking, all included. Considering they might end up being killed it’s tragically comic. On top of that, the three are really endearing characters. The movie also criticizes once more the inefficiency and cynicism of high command and the ultimate uselessness of the UNPROFOR troops who, as usual, aren’t allowed to do anything. On top of that a group of sensation-seeking journalists appears and makes matters worse. Both camps send people into the foxhole which becomes a sort of neutral zone. Journalists are there, de-mining experts, UN troops and what not. Everybody wants to give their opinion, no one is capable of helping. If you want to know whether poor Cera will be saved, you will have to watch the movie. No Man’s Land is outstanding and manages like not many to make a very profound anti-war statement. One word of caution: Should you just have stopped smoking you shouldn’t watch this movie. I have hardly every seen such a lot of smoking going on in any movie. Even a lifelong non-smoker like myself started to feel a certain urge after a while. I almost forgot to mention that No Man’s Land is a Bosnia & Herzegovina/FR/IT/Slov/UK/BE co-production.